COR®BON’s DPX® Handgun ammunition exhibits superior performance to all other defensive ammunition on the market. The reason is the homogenous solid copper projectile. “Barrier blind” is the new terminology for ammunition that outstandingly performs after penetrating a heavy barrier like auto glass or steel. 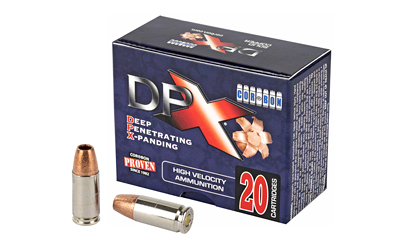 DPX® is the only ammunition that maintains 100% of its weight after going through such barriers. The DPX bullet is a 100% solid copper bullet. Internal serration cuts have been added instead of traditional external serrations. These internal serration cuts allow the copper bullet to fully expand making the bullet double diameter with 6 razor sharp pedals.